Yes, It's "Better Than Bouillon"! Dissolves Easily - No Need To Crumble! 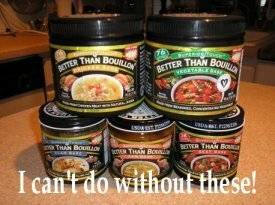 I just can't say enough good things about this Better Than Bouillon super product! No more breaking your fingers trying to crumble up a crusty old cube ... or waiting hours for the darned thing to dissolve! I use this ready-to-go stock day in and day out. I discovered it years ago and I swear by it. I find that a rounded tablespoon makes a good cup of stock – but it's easy to add more stock for more flavor - conversely add more water if the stock is "too tasty!" The photo at the top of the page shows the flavors I use on a regular basis. I use the chicken stock in my chicken noodle soup; the beef stock in my beef stew! 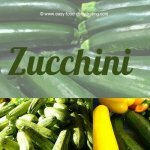 The big jars are ordered and shipped direct from them directly but the smaller jars I buy when I need them at the local grocery store to save on shipping costs. Unfortunately, they've changed "the rules" and now you can only buy the big jars at Costco. That's a shame if you're not a member ... grrr. I'll have to go bug someone I know who may have a membership there as the nearest store is in Orlando (2 hours away for me). Sometimes you don't need or want extra jars of clam base, for instance, but you surely do need the convenience of the big back-up plastic containers of the chicken base and the vegetable base stocks, IMHO. They have a long shelf-life, so don't worry about Better than Bouillon expiring too soon. When you have opened a container, keep it in the refrigerator where it'll last for months too! The flavors are delicious — and they have organic varieties too along with vegetarian, reduced sodium, and kosher based stocks! They also sell gravies and crock-pot seasoning mixes. Visit them at Better Than Bouillon or click on the big photo at the very top of the page. Sign up at their site to become a member of their "Culinary Club" to receive product news, and the all-important $aving$. Make meals that even your kids and spouse will eat ~ even if they contain dehydrated food! They'll never know the difference. If you happen to have enough fresh ingredients on hand, you'll be happy to know that our Recipe eBook also has the amount of fresh food to use in lieu of dehydrated food. Many of our recipes include the bouillon brand "Better Than Bouillon" and for good reason. It's the easiest to use bouillon out there! Heck my dad says he can just drink the hot chicken stock on its own - it's that good. Our recipe eBook is available direct from our website or from Amazon as a Kindle eBook. Click here for the Kindle version; for our eBook, click here or on the book image.